This post is the third of a series on Threat Intelligence Automation topic. After building the architecture and integrating the InfoSec feeds from italian CERT-PA into MineMeld and the near-real-time SOC engine, it’s time to put another brick to build an effective community: export internal IoC to the community in a standard format so authorized parties can get it and use them as they want. The ultimate goal is to build a community that can share IoC using a standard language and a transport mechanism (STIX/TAXXI) getting data from heterogeneous sources (more integration examples in next posts) and injecting data into the community network. This post is the second of a series on Threat Intelligence Automation topic. On the first post of my threat intelligence automation jurney I wrote why I choosed MineMeld, the architecture implemented and the hardening steps. One of the goals is to connect MineMeld to heterogeneous external sources to get IoC (Indicators of Compromise) and integrate it into our i-SOC (Information Security Operation Center) near-real-time engine to get evidences of security events to be analyzed by i-SOC analysts. 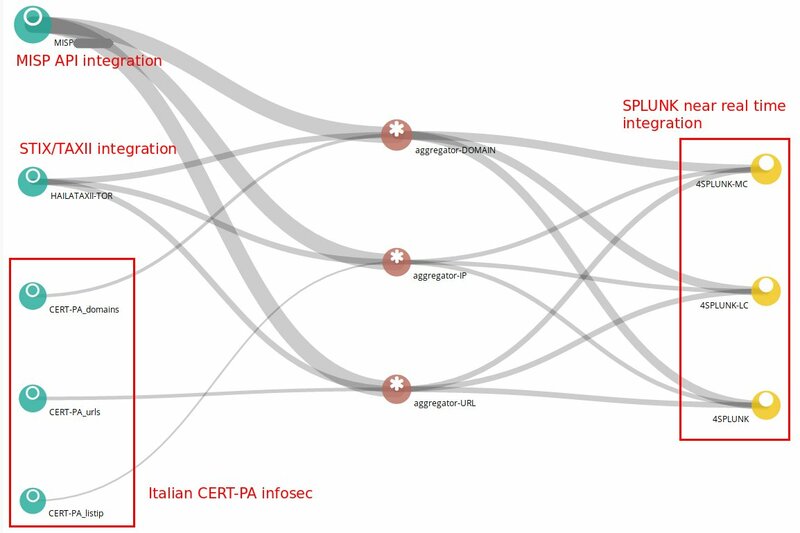 In this post I show the foundation of the threat intelligence automation model: how I wrote a custom prototype to get the InfoSec feeds from italian CERT-PA (Public Administration – italian web site) and how I integrated these feeds into Splunk near-real-time engine. I started with this integration because InfoSec has very good feeds (IP, URLs, domains) that are not just copy&paste from OSINT sources but are often updated and automatically analyzed to check that IoC are still “alive”. Last slide at my HackInBo talk (italian) was about how to automatically integrate threat intelligence feeds into our near-real-time Information Security Operation Center (i-SOC) SPLUNK engine to reduce the time spent by SOC security analysts on IoC (Indicators of Compromise) analysis. At the time I was testing an open source project from PaloAlto: MineMeld. It was the right choice; after extensive tests MineMeld now help me to solve the challenges I had in the past while playing with IoC coming from various threat intelligence sources: collection automation, unduplication, aging and SOC integration.